Find My Workspace lists over 95% of the business centres market in Shipley. Simply click Request Quote to check pricing for one office, or Add to Basket for multiple offices. 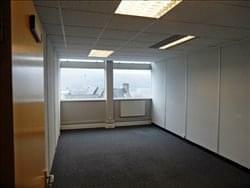 Based in Shipley, this business centre offers first and second floor serviced offices suitable for two workstations up to eight. Tenants will benefit from a rate that is all inclusive of bills and offered on a simple 12 month license. Suites benefit from lots of natural light, creating a productive environment, and also boasts modern suspended ceilings and CAT II lighting. Each floor benefits from toilet facilities too. Other amenities include 24 hour access – allowing you to ditch the traditional 9 till 5 and set your own working hours – an open plan layout, kitchen facilities and entry phone system. To obtain information for your selected West Yorkshire Business Centres, please tick the "Add to basket" box for each office you prefer and complete the form below. We will then send a detailed report via email.